tropical underwater wall and ceiling mural by Visionary Mural Co.
With the help of Jill Schultz McGannon, McKeithan created this underwater themed bath suite for a teenage boy. The suite adjoins “Desert Island Bedroom.” The underwater colors and scene coordinate with a tile mosaic on the floors of the suite and on the wall of the shower. 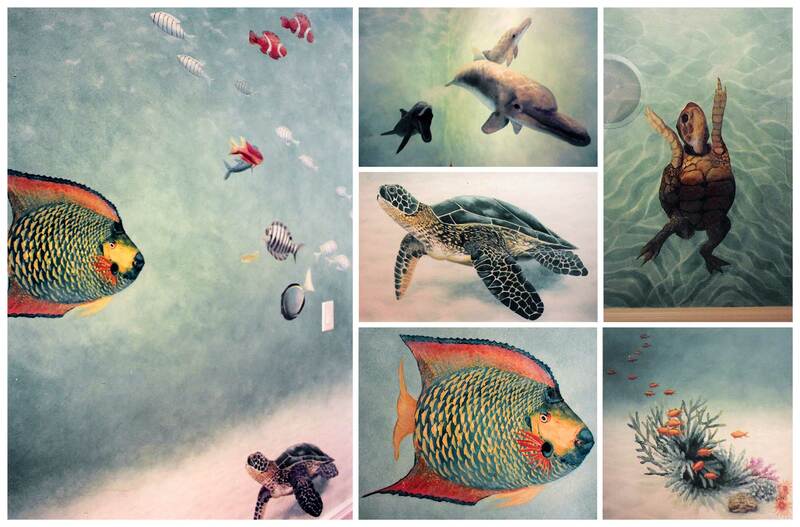 The underwater mural includes details like three dolphins, two sea turtles, a clown fish, angel fish, a lion fish, coral, a scuba diver and many other fish friends swimming around a tranquil Caribbean Sea, all reminiscent of the family’s favorite vacations.